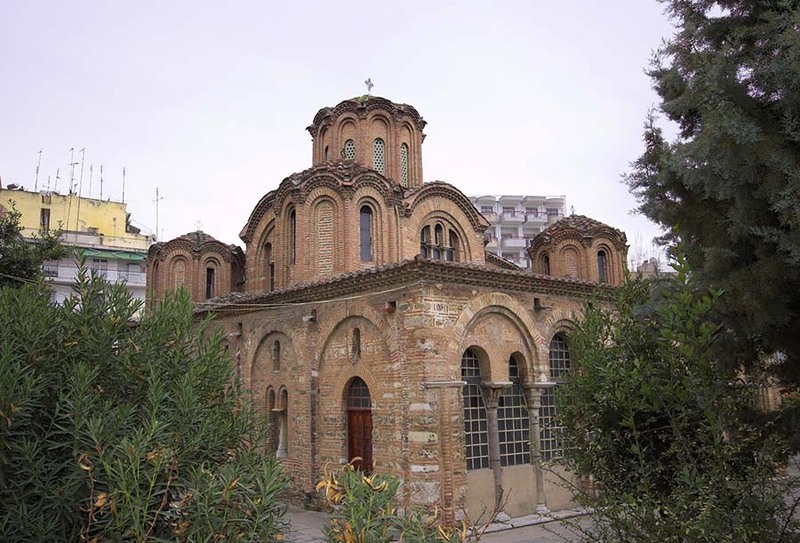 History- Name Origin: The Church of Panagia Chalkeon, also known as “Red Church” possibly because of its wall construction mainly made of bricks, is situated in the southwest of the Roman Agora of Thessaloniki and in the north of Egnatia Street. It is the only surviving temple of the Middle Byzantine era. According to the found inscription of the marble lintel of its west entrance, it is estimated to have been built in 1028 A.D. by the protospatharios and governor of Loggovardia, Christopher and his family, in honour of Panagia Mother of God, on the exact place where an ancient pagan temple pre-existed. In 1430, the temple had been transformed into a mosque and took the name Kazantzilar (in other words “mosque of the copper makers”) because of the existence of copper makers in the area since byzantine times until nowadays, which explains its current name “Panagia Chalkeon” (Panagia of the Copper Makers). 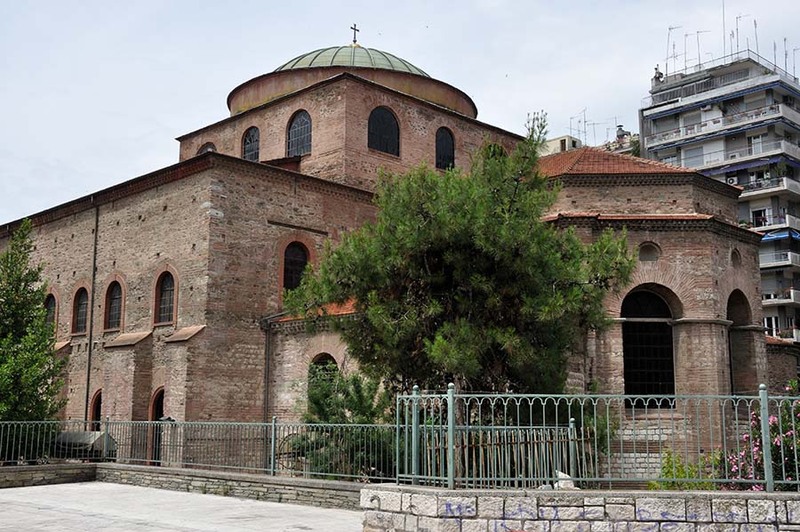 Its byzantine name had possibly been “Pagagia of Chalkoprateia” just as a Church in Constantinople of the same name. 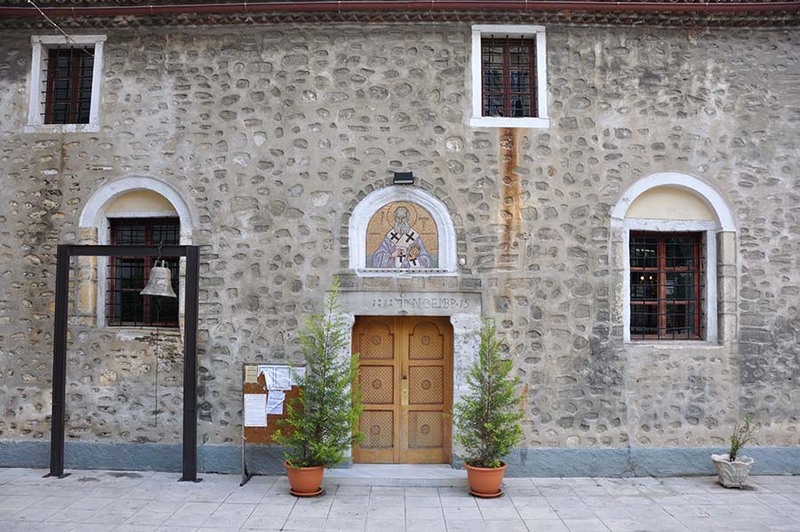 The Church returned to the Christian Orthodox community for worship purposes after Thessaloniki’s liberation. The earthquake of 1932 caused to the monument several damages. These had been repaired during the 30’s, after the embankments that used to cover the monument to the height of the marble cornice, were removed. Architecture: Panagia Chalkeon belongs to the architectural type of “complex four column σcruciform temple”, disposing a typical central dome that stands with the help of four columns. In its western side, there is a narthex consisted of two floors, covered by two domes. In the eastern side, a tri-part Holy Altar is being developed with a central arch consisted of three sides, in its exterior. In the center of the northern part, the grave of the temple’s founder can be easily noticed inside a arcosolium. The temple is built completely according the technique of the «hidden brick» and the walls are decorated on their exterior side with many windows, graduated arcs, jagged strips, visors, semi columns, smaller columns and pessaries, as well as a marble cornice that decorate the whole temple. In its southern part, under the cornice, ceramic glazed tiles still survive disposing a cufic decoration. Wall decoration: The temple’s wall decoration belongs to two different phases. The first phase is contemporary with the construction of the temple, according to the found inscription on the painted decoration of the Holy Altar and is estimated to have been completed by the second quarter of the 11th century (1030- 1040 A.D). The wall decoration of the dome also belongs to the same period and is consisted of scenes of the Jesus Christ Ascension, Panagia, the Holy Three Hierarchs and two scenes of the Holy Community that decorate the Holy Altar, scenes from the Christological circle that can be found on the walls of the central temple as well as the magnificent representation of the Second Advent on the narthex. The second phase of the temple’s decoration belongs to the Paleologeian era and dates back to the first half of the 14th century A.D. The painting decoration of the Akathistos Ymnos, as well as remains of the scene of the Assumption of Panagia still survive in the western part of the wall, just under the visor.